When the new semester rolls around, you have a couple of choices. You can start over (which you probably don't want to do and since that doesn't involve any more steps, you can stop reading now) or you can copy information from a previous course, which is what I'm going to assume you want to do. 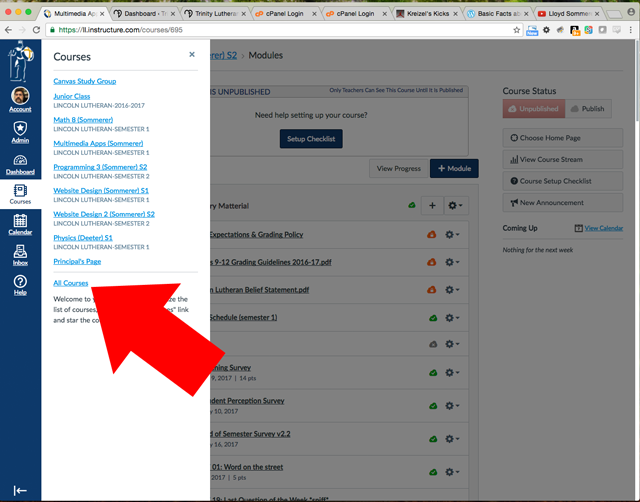 In Canvas, click on "Courses" from the left side menu, then click on "All Courses" near the bottom of the slide out menu. 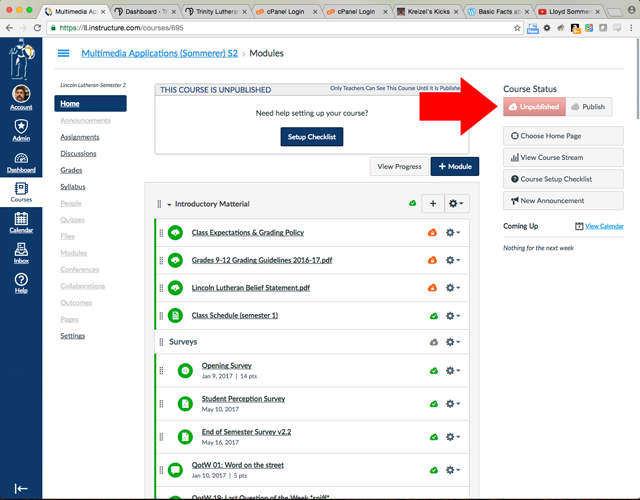 Before you click on the course that you are going to work on, you might want to click the star to the left of the name, so that it appears on your Dashboard and in your short list of courses. 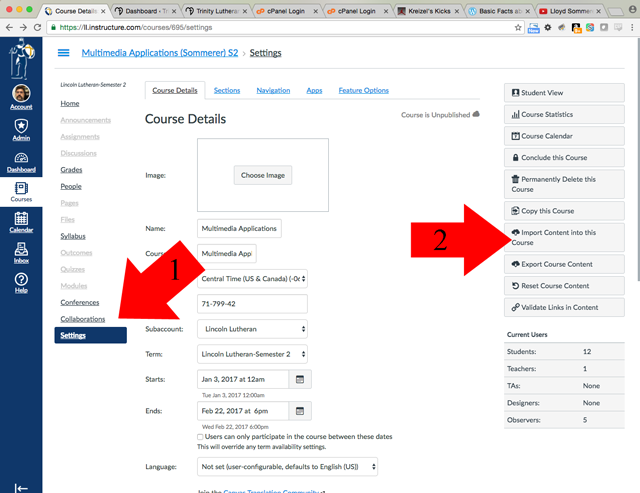 Now that you have the courses selected, click on "Settings" and then choose "Import Content into this Course" from the right side of the screen. Note: if you are using a narrow screen, these options can be "bumped" to the bottom of the page. If you don't see them on the right, just scroll down. Search for a course: Type in the first few letters of the course name or your own name. Note that you might have to check the "Include Completed Courses" checkbox if the course you want is no longer active (I'm really just guessing here). Content: I chose "Select Specific Content". That way I could not import anything that was specific to the previous semester. For me that was Announcements. If you are importing from the first semester of a year long course to the second semester, you might want to be very selective in what you import. Options: You probably want to check "Adjust events and due dates". The only time you might not want to bother with this is if you are importing from the first semester of a year long course to the second semester. In that case there probably are not any events or due dates what you are going to select when you import specific contend. Date adjustment: If you chose to adjust events and due dates above, then you will have a few more choices to make. Shift dates will cause Canvas to attempt to adjust the dates of events and assignments based on the starting dates of the two courses. I chosing Shift dates and it looked like it did a pretty good job of figuring out the new dates. If you Remove dates, you'll have to add all of the due date information again, but at least you know if will be right. Beginning date: If you choose to shift the dates, you should enter the "change to" date to the first day of the new course. I don't think you have to do anything to the ending date. 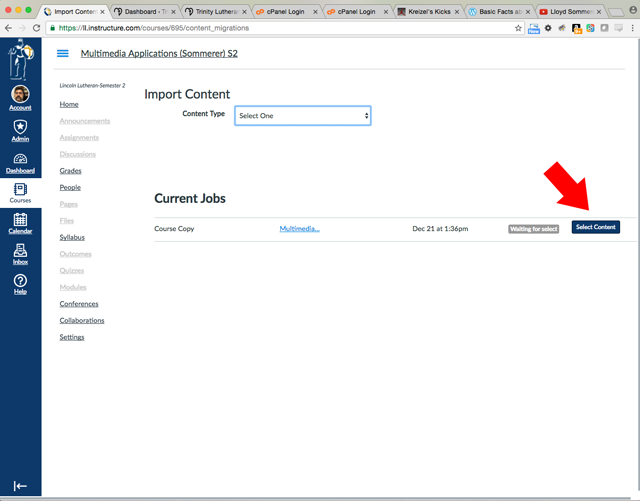 When you have the setting entered, click on the blue Import button at the bottom of the page. 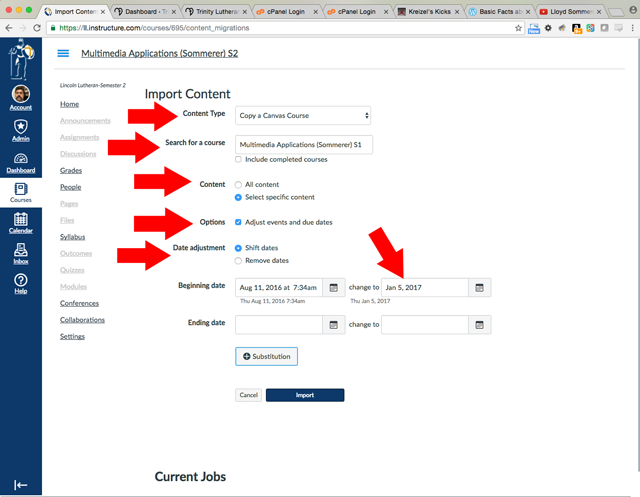 If you chose to select the content that you will be importing, you'll do that now. 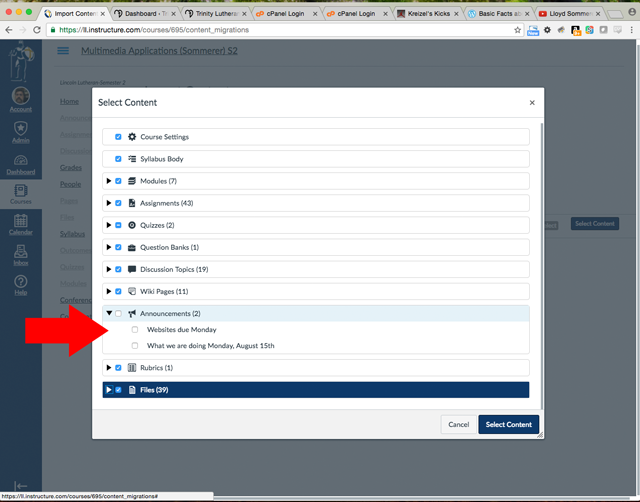 Click on the blue Select Content button for the class that you are working on. You'll have to look through your content and decide what you want to carry over to your new course. If there are things that you know you will not be doing, then don't select those things. The only thing I didn't carry over were Announcements. If you are importing from the first semester of a year long course to the second semester, you might want to be very selective in what you import. You probably always want to copy Course Settings and Syllabus Body, after that it's up to you. I would say it would be better to import too much than too little. You can always delete things. You can sit around and watch the little "running" animation if you like. Eventually it will change to "Completed". Now go to your course (it's on your dashboard if you remembered to click the star in step 1), and change it from Unpublished to Published. You should probably check on the due dates of at least the first week or two of assignments just to make sure they shifted in a reasonable fashion. How do I add additional students to my Canvas Account? How do I blank in Canvas? How do I create a parent account in Canvas? How do I write on PDFs in Canvas?